MMFF 2014 official entries have been announced yesterday by the Metro Manila Development Authority (MMDA). The films which made it as one of the 8 official entries will star once again MMFF regulars Vice Ganda, Kris Aquino, Vic Sotto and ER Ejercito, plus returning Kim Chiu, Dingdong Dantes and Dennis Trillo, and for the first time, Coco Martin and Angeline Quinto. My guesses are all correct. I correctly predicted all the 8 official entries for the 40th Metro Manila Film Festigval (MMFF 2014) this December. So obviously, the festival's selection committee being headed by the MMDA has selected the entries which have the biggest potential of earning big, as in the case during the festival's editions in previous years. For the MMDA, probably, the 5 entries who were rejected and didn't make the cut seemed to have no commercially appealing cast, apart from being submitted by not so well-known producers. This is MMFF, where the script of the movie doesn't matter that much. 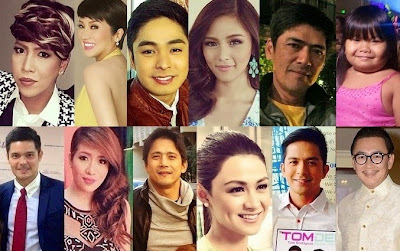 Chech out the MMFF 2014 official entries, and pick the movies or movies which you are going to watch when the festival opens on December 25.
under Philippians Productions & Events Inc.
under ABS-CBN Film Production Inc. and Kris Aquino Productions, Inc.
under Reality Entertainment, GMA Films and Agostodos Pictures Inc.
under Scenema Concept International Inc. UNDER OctoArts Films, MZET Films and APT Entertainment, Inc.
Aling pelikula ang papanoorin mo sa MMFF 2014?